Another Coleman product with the strength and durability the name represents. 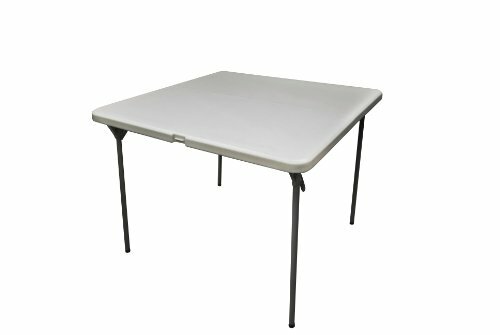 High-density polyethylene plastic blow molded 36-inch square fold in half table with blended light gray color and a smooth surface is stronger and more durable than the comparable wood tables, suitable for indoor and outdoor use (indoor storage recommended). Easy to clean two piece top is hermetically sealed against biological contamination and resists heat and stains (need to use protective hot plates for hot items) . Average thickness of plastic is engineered to be 1.75" (45mm) thick. Strong steel folding legs provide support for almost any home and outdoor use, yet easy to carry and store. The table folds in to a flat size of 3" x 18.5" x 36".